Cholla is a term applied to various shrubby cacti of the Opuntia genus (Family Cactacea) with cylindrical stems composed of segmented joints. These stems are actually modified branches that serve several functions -- water storage, photosynthesis and flower production. 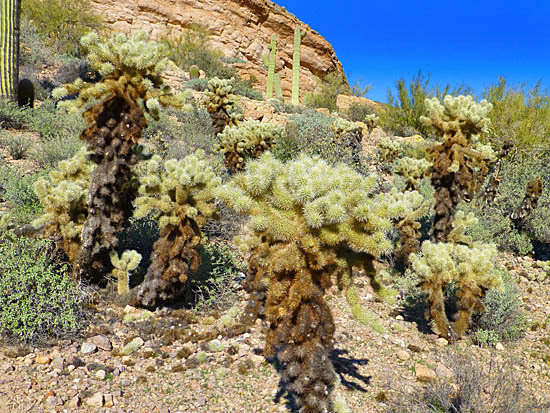 Cholla cactus are found in all of the hot deserts of the American Southwest, with different species having adapted to different locale and elevation ranges. Most require coarse, well-drained soil in dry, rocky flats or slopes. Some have adapted to mountain forests, while others require steep, rocky slopes in mountain foothills. Most species bloom April through June, depending on local conditions. Stems and joints vary in width, length, shape, and color, as well as in the profusion of spines and glochids. Well known species include: Teddy Bear, Buckthorn, Silver, Pencil, Christmas, Chain Fruit and Staghorn.